Click image to enlarge it. For more Wordless Wednesday, click here. 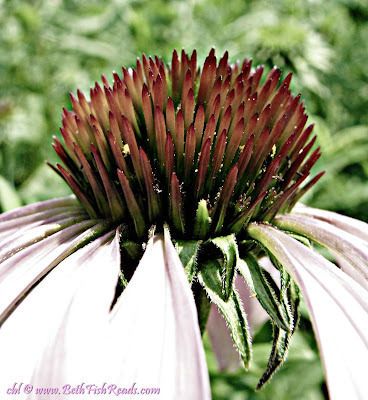 My second attempt at using an effect de-saturated the color of this purple coneflower. I kind of like it. yes, it is a cool effect.. I agree, very cool. Nice photo. Looks good this way too. My favorites! I love those so very much!! very interesting perspective. i love it. Nice effect. I like the textures in the coneflowers. I love the detail you captured! It does look really good. I like the way the flower pops out of the unfocused background. Nice job! That is a nice effect. Love macro shots, too. Love the hair-like things on the flower, it is as if it is trying to grow a 5 o'clock shadow! Happy WW, and Happy 4th! beautiful .. and a happy safe Fourth to you! It has a mystical quality that reminds me of the strange bright light that occasionally happens after a storm. I love the up close details in this picture, you can also see the fuzz on the green flower parts. Great. very cool - and so much better full size! Oh wow! I have never seen a flower like that one before! Great photo today! You are so good at this! Great close-up of the flower. At this angle, it looks like a different creature altogether. I love the effect! It's a great shot. Coneflowers are such a pretty and interesting flower.